Episode 4 English. Bir is short for bird. Dra is short for dragon. Patamon + OO Her flapping burns even the heavens! 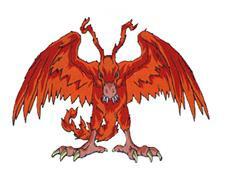 Has the power of "sky"
Piyomon + O This Giant Bird Digimon is protected by fire! Has the power of "sky"